Whether you start your own seeds indoors before the last frost or you buy seedlings from your local garden center, you’ll want to know the best way to plant tomatoes to ensure you get a strong, successful, and productive plant. While you can just put your seedlings in the ground and hope for the best, with the right planting, staking, and feeding, your tomato plants can produce rich, flavorful fruits. Prep the garden area where you’ll be planting your tomatoes by digging and loosening the soil 8 to 10 inches deep. The location for your tomatoes needs to be in full sun with good drainage where you can get to it easily for watering and maintenance. Apply a low-nitrogen fertilizer over the bed and mix it in according to the instructions on the packaging. Continue to fertilize with your low-nitrogen fertilizer as often as the packaging recommends up until you see the first set of fruits starting on the vines. At that point stop fertilizing for the season. Dig a hole for each seedling, spacing the holes 18 to 24 inches apart in the bed. Each hole should be an oblong shape, 3 to 4 inches deep and about as wide as the seedlings you have ready to plant. Strip the lower leaves from each seedling by pinching the leaves off with your fingernails or a pair of sharp herb scissors where the leaves extend out from the main stem. Leave only the top portion of the tomato leaves intact. Remove the pot from the seedling’s root ball and lay the seedling into the oblong hole so that only the upper 20 percent of the plant is sticking up from the ground. Cover over the root ball and the lower portion of the stem with soil so the stem can form new roots. 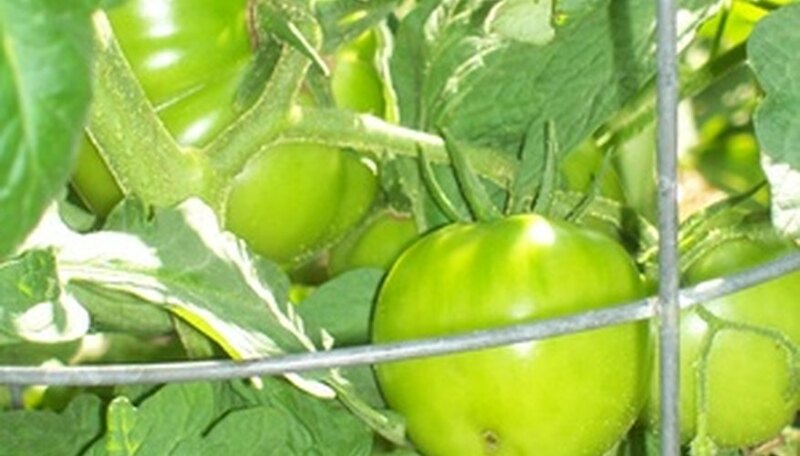 Place a tomato cage, garden stake, or trellis at each seedling and train the stem to the support as it grows to support the weight of the tomatoes. Water the seedlings well to keep the soil moist but not overly soaked for the first few weeks. After about a month you should be able to back off to once or twice weekly deeper waterings. If frost threatens your tender seedlings, then cover them over with a sheet, newspaper, paper bag, or milk jug with the bottom cut off. Just make sure you remember to remove it in the morning so your seedlings have plenty of light.